We’ve discovered in the previous article some of the details on the way I’ve built the Silverlight application. Let’s now review the choice I’ve done on the Windows Azure Storage part. Note : if you’d like to know more about Windows Azure, please have a look to the Windows Azure Platform training course: http://channel9.msdn.com/learn/courses/Azure/ and download the Windows Azure training kit here. 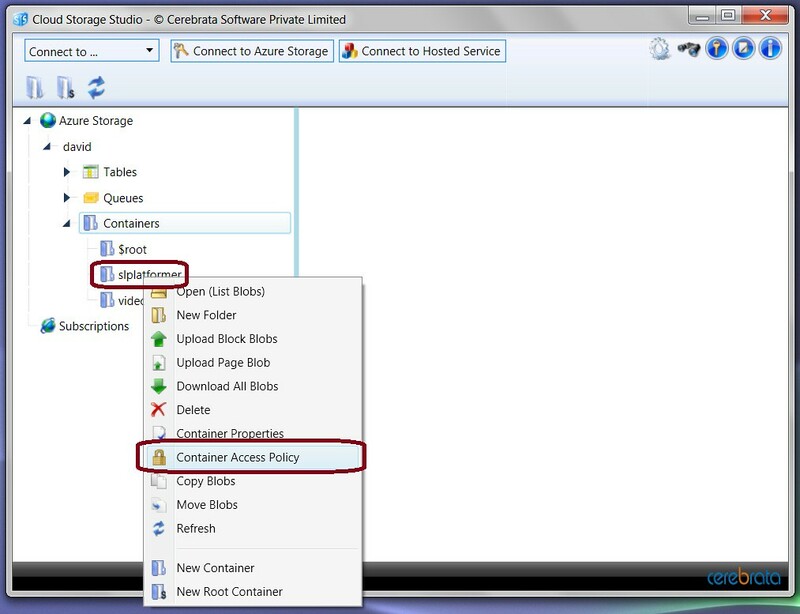 You’ll find a specific section on the Azure storage. My objective was to store the game levels in the cloud without needing a specific server logic doing the access control and/or acting as a proxy for the download/upload of the files. I was then looking for a solution as simple as a classical HTTP PUT on a regular Web server to save my levels in the cloud. This key is very important and should be kept confidential. You shouldn’t share it with the rest of the world. 🙂 Thus, to be able to discuss directly to the Windows Azure storage from the Silverlight client application, we would need to hard code this key inside the Silverlight code. And this finally means sharing the key with the rest of the world as disassembling a Silverlight application to really easy. 2 – This Web Role is hosting a WCF service using the primary key and the storage APIs to push the files into the Azure blobs using HTTP REST requests. This WCF service exposes some methods to retrieve information from the blogs. This service could also add some access logic control. 3 – The Silverlight client references the WCF service, authenticates and uses the read/write methods through HTTP calls. We then have a proxy in the middle that I’d like to remove. Let’s remind you what I’d like to achieve: use the Azure storage directly from the Silverlight application without using a WCF service but without providing you my primary key neither. So: is this possible or not? Yes it is! However, we can’t allow writing operations for everybody on an Azure Storage container. Hopefully, we can create temporally valid URLs on which we will set specific rights: allow files listing, reading the files, writing files or delete files. This is what we call “Shared Keys”. 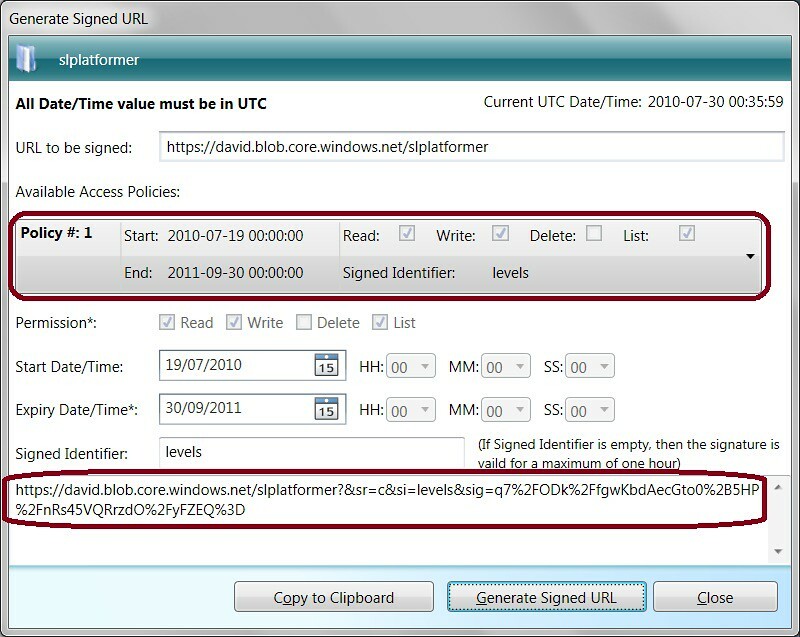 – There is also an excellent blog posts series from Steve Marx on this topic: http://blog.smarx.com/posts/uploading-windows-azure-blobs-from-silverlight-part-1-shared-access-signatures . His blog should be part of your favorite links if it’s not yet the case! Steve is explaining here how to generate shared keys dynamically on the server side to let a Silverlight client application doing some multi-upload of files on his Azure storage using this special limited in time URLs. To generate this key, rather than using the Azure SDK and a little piece of .NET code to do it as you can see in the downloadable Steve’s sample, I’ve chosen to do it via an awesome tool named Cloud Storage Studio. This is a commercial software written in WPF with a 30 days evaluation period. There is even a fun Silverlight application you may test online: https://onlinedemo.cerebrata.com/cerebrata.cloudstorage/ but it’s currently much more limited that the rich client application. 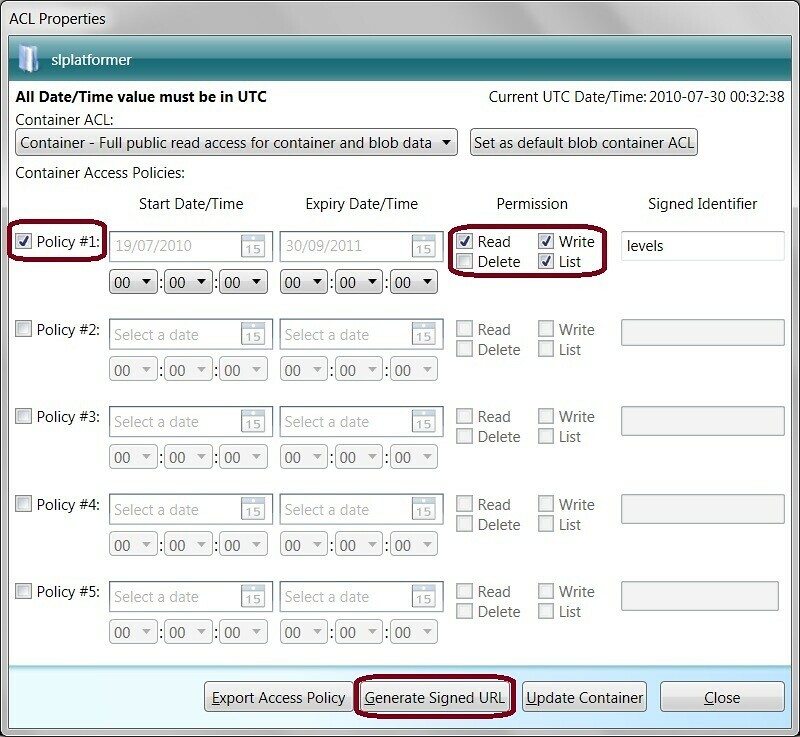 Choose in the combobox the policy you’ve just created and click on the “Generate Signed URL” button. You’ll have the same kind of URL displayed at the end of the above screenshot. There are 2 parts to handle on the Silverlight side. First of all, we need to launch an HTTP request on the Azure container to know the current available files to download. After that, we need to launch several requests to download all these files and to load in memory the associated levels. However, you’ll see that using this approach, we’re not controlling the order of the received files. Indeed, we’re launching almost simultaneously N requests via N different WebClient. The different levels won’t then systematically arrive in the expected order 0.txt, 1.txt, etc. as these requests are not serialized. In order to make this complete sample works, don’t forget to add the ClientAccessPolicy.xml file in the root$ folder of your storage account. Again, this operation can be easily done with the Cloud Storage Studio or with a piece of .NET code. We’ll finally see in the next and final article the details around the Windows Phone 7 XNA game where you’ll be able to download its source code.